As we headed out of Eastney and into Southsea we passed the Royal Marines Museum. At its entrance is an imposing, larger-than-life statue of a Royal Marine. 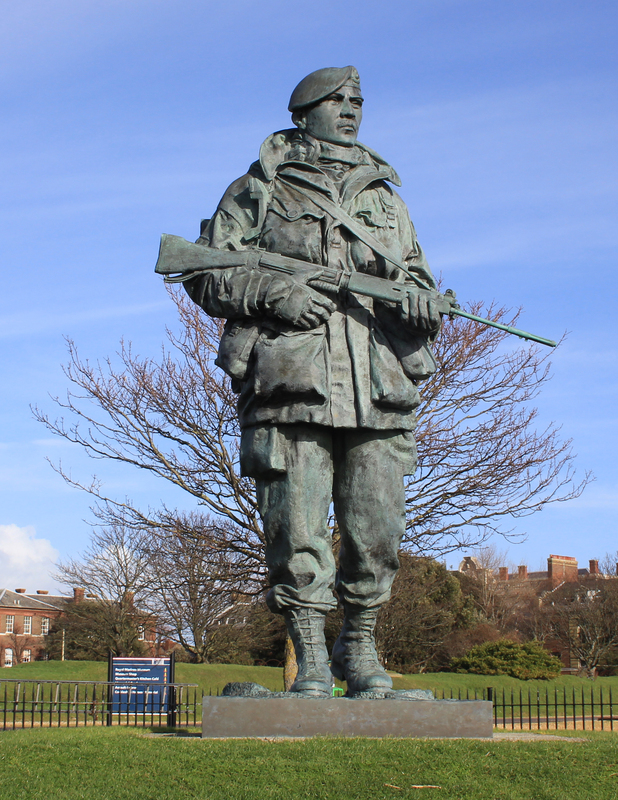 The statue is based on a photograph of one particular member of the Royal Marines trudging towards Port Stanley in a line of men. The photo was reportedly taken shortly after the Argentine surrender on 14 June 1982. The photo that inspired the sculpture was of Corporal Peter Robinson. As news broke of the Argentine surrender, he borrowed a Union Jack flag from a friend and stuck it in his pack. It was no doubt this flag which prompted Petty Officer Peter Holdgate to take the photo, which became one of the most famous taken during the war. The photo was taken from behind, showing the backs of the Marines as they marched onwards towards Port Stanley. I think that photographs are best taken from the front, showing the faces of those marching ever onwards. I sympathise, however, with Petty Officer Holdgate. On our Coastal Path I am constantly trying to take photographs but our Coastal Clan are very regularly walking away from the camera and so all I get is backs and buttocks. They should consider themselves lucky – I am generally behind the camera and not in front of it. Within the swirling mists of time I’ll be lucky to be identified at all. We continued onwards, towards Portsmouth’s South Parade Pier. I enjoy walking up piers. I like reaching the pier heads and looking back and forth along the coastline. I like looking back the way we’ve been, remembering points along the coastline. I enjoy looking onwards towards places we have yet to visit. 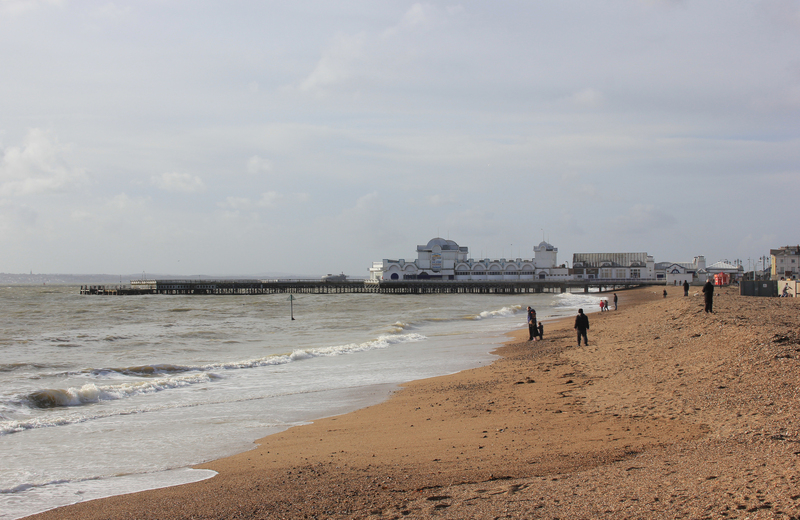 Piers tend to have somewhat checkered histories and South Parade Pier is no different from many others. It has suffered no less than three fires, the most famous of which was during the filming of The Who’s rock opera, Tommy, in 1974. During the Bernie’s Holiday Camp Scene Oliver Reed and Ann-Margaret were being filmed dancing on the pier when the heat from a spotlight set some drapes on fire. If you watch the film look closely – the smoke from that fire can be seen drifting in front of the camera. What cannot be seen are the 20 fire engines and 100 firemen who ended up tackling the blaze. This was the third fire in the pier’s history. 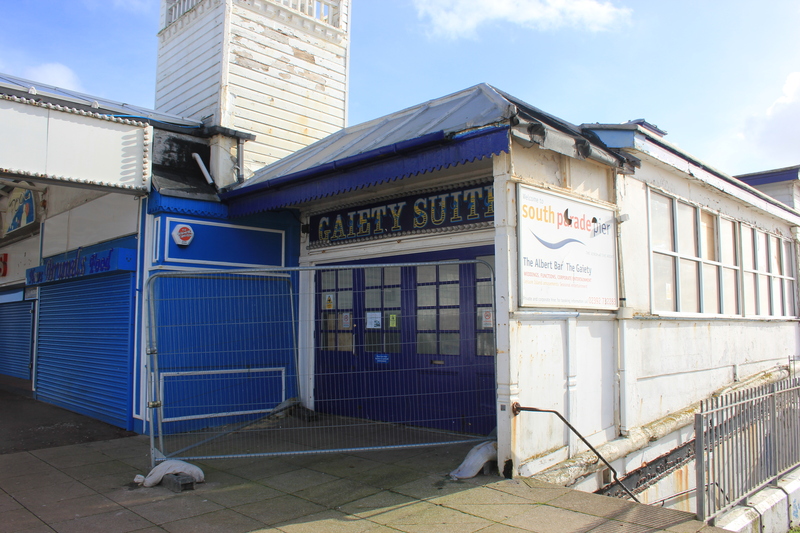 The pier, like many others, is under threat, but the threat here is very current. In November 2012 the pier was closed and fenced off to the public as it was considered dangerous. In December 2012 it was put up for auction but failed to sell. Three days after we passed this pier, parts of its boat deck were broken off by storms which battered England during those mild but wild days. I wonder what will happen to this pier. Will it still exist when we finish our walk around the coast of Britain? This entry was posted in Hampshire, Islands and tagged coast, Falklands War, pier, royal marine, southsea, statue, Tommy, travel, walking. Bookmark the permalink. It would be a shame to see that pier go, but there are few now threatened on the south coast, Hastings is one. This is the only proper pier in Portsmouth (the other one, Clarence Pier, is more a jetty than a pier). As at this particular point in time I think Hastings is critically endangered rather than threatened! I agree though that too many of these piers are in decline, particularly given that so many of them are enjoyed by so many people. I so love the pleasure piers of Britain. My only experience with your piers was in Brighton & it was fabulous! It’s such a shame to have these wonderful pieces of the past come to ruin. Our closest example might be Navy Pier in Chicago. But that’s on Lake Michigan. And we have a brand-spanking new pleasure pier in Galveston, Texas (jutting out into the Gulf of Mexico). Haven’t been there yet though.